Musicals can be hit or miss for me. The genre’s insistence to break into song and dance can make it difficult to embrace the narrative, as it sometimes removes me from the context of the situation itself. So it’s interesting to see a film that’s nothing but song – a film where dialogue is spoken lyrically with a musical backdrop. Never seeing a film that approaches this style before, I was taken aback by how much I enjoyed it. 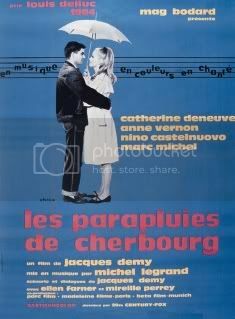 There was something surprisingly natural about the way the dialogue and visuals flow together, to the point that it’s hard to imagine The Umbrellas of Cherbourg existing as anything but a musical. Demy’s film opens with a wonderful credits sequence – an overhead shot sees passing pedestrians with their umbrellas as they walk to their destination. It’s simple, it’s visually astute, and most of all, it’s pleasing. We then move on to our character - Guy Foucher (Nino Castelnuovo) is a mechanic and he’s in love with a young girl named Geneviève Emery (Catherine Deneuve). Demy defines his characters as concisely as possible, giving them just enough detail to flesh them out while minimizing unnecessary (from a narrative standpoint) exposition. Guy wants to marry Geneviève, but they face the sort of traditional obstacles that comes with a melodrama – Geneviève’s mother thinks she is too young, while Guy is juggling the responsibility of caring for his ailing godmother and his impending draft notice. And as Guy and Geneviève begin to prepare for their wedding, Guy receives his notice, putting everything between them on hold. The trouble is that he leaves Geneviève pregnant. Geneviève now has to decide between waiting for Guy while taking care of the child on her own, or to accept the offer of a prosperous jewelry merchant who becomes smitten with her. The drama! Normally, I would be turned off by such theatrics and melodrama, but given the candy-coated atmosphere and singing, it all seems to work in this alternate reality. Demy obviously admires the traditional melodrama of Hollywood pictures, and by adapting the general idea of it to his musical, he revitalizes the age-old story into something pulsating and new. I won’t argue that The Umbrellas of Cherbourg follows a very obvious and straightforward trajectory, so much that it’s conceivable to predict the ending by the end of the first act, but that knowledge didn’t hinder the film’s energy. You give yourself to the nostalgia and cuteness of its world to the point that it make its faults seem less glaring.